These weekly Korean lessons in Amsterdam are taking a large part of my weekends, so when non curriculum events occur I usually get on my way. 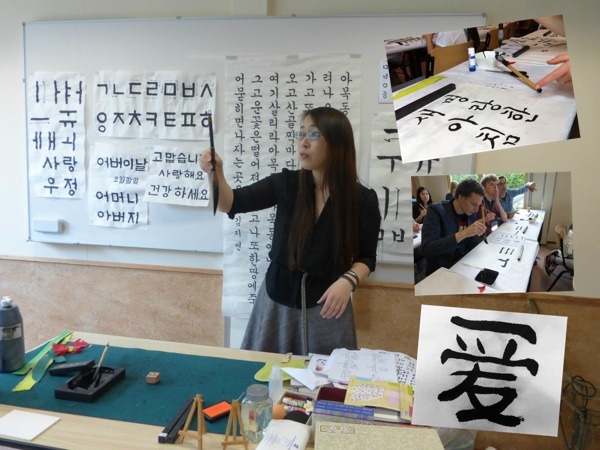 However, last week, they organised a calligraphy workshop. Since my father-in-law considers calligraphy more then a hobby, I felt obliged to partake. Whilst I didn’t expect it, calligraphy is quite fun. There is also something tranquil about putting hangeul or a hanja character on paper. Together with an official stamp, our first attempts looked like the real deal.